The Main Event! 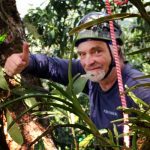 Share techniques, tales, and time together with other tree-climbing enthusiasts at the Savegre Lodge, located among the giant tropical oaks of Costa Rica’s Cordillera de Talamanca Cloud Forest. tours, entrance fees, bilingual naturalist guide. The price does not include alcoholic drinks or tips. Additional $495 per person, double occupancy. Additional $455 per person, double occupancy. Additional $265 per person, double occupancy. 1. Take a good look at the side trips detailed decide what works for you. Ask me any questions about the options. 2. Fill out online Registration Form. 3. If you are in the US, mail a check made out to “Carlos Roberto Chavarria” to me at Eric Folmer, 1610 Seventh Street, Berkeley, CA 94710. 4. If you are outside of the US, send me the email and we will figure out the easiest way for payment. Pick up at hotels in the San Jose area. We can recommend hotels and book for you. You are also welcome to make your own arrangements. If you do, please check with us first about pick up at the location. Lunch at San Luis Reserve. Hike and rainforest exploration. Check in at Kokoro Hotel. Breakfast and depart form Savegre to the southern Pacific coast. Arrive at the Sierpe River. Boat trip down the river surrounded by mangroves and down the Pacific Coast to San Josecito Beach just north of Corcovado National Park. Check in and lunch at Poor Man’s Paradise. Walk to Rio Claro, relax, swim and explore by kayak. Learn about local sea turtle conservation efforts. Dinner and spend the night at Poor Man’s Paradise. Early breakfast and departure by boat to Corcovado National Park, the largest wild primary forest on the Pacific Coast of Central America. Back to Poor Man’s Paradise for a late lunch. Free time to climb and enjoy the beach. Dinner and overnight at Poor Man’s Paradise. Breakfast and depart by boat to Caño Island for marine mammal viewing and snorkeling. Great opportunity to see dolphins and humpback whales. There is an option for scuba diving (not included). Free afternoon to climb, explore and enjoy the beach. Breakfast and depart by boat for Sierpe. Stop at Esperes Park to see large stone spheres made by the local ancient civilization. Boat trip on the Tarcoles Rives, a great opportunity to see large crocodiles and many species of birds. Continue on to hotels in San Jose.